Sermon on Isaiah 6:1-8 offered to the people of the Church of the Redeemer in Bryn Mawr, Pennsylvania. Audio for this sermon may be found here. 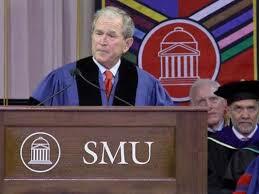 A few weeks ago, George W. Bush offered the commencement address at Southern Methodist University. At one point, he offered these words of encouragement to the graduating class: “For those of you graduating with high honors and distinctions, I say well done. And as I like to tell the ‘C’ students, you too can be president.” With this quip, our former president was employing one of the well worn conventions of the genre. Self deprecating humor is just one of those things people tend to expect from commencement addresses. But the element that everyone expects from a commencement address is an affirmation of the boundless potential of the graduating class. During the months of May and June, countless speakers tell the young women and men gathered before them that if they follow their passions, they can make the world a better place. The cynical among us might say that commencement speakers say this in order to assure people that the time, money, and energy they spent earning their degree was worthwhile. But I suspect that this vote of confidence for the graduating class stems from a genuine hope that by excelling in their chosen field, the members of graduating class can make a difference and change the world. Isaiah son of Amoz was a man who excelled in his chosen field. Now, when I say “chosen,” I should make it clear that he was chosen by birth to serve God as a priest in the Temple. And when I say that he “excelled,” I should make it clear that Isaiah did exactly what was expected of a priest in the Temple. Isaiah was one of those charged with the responsibility of maintaining the delicate balance between sin and righteousness. He made sacrifices and offerings to God on behalf of his people in order to negate the effects of their sins. We can assume that this is what Isaiah was doing on that fateful day in the year King Uzziah died. As he went about his priestly business, Isaiah experienced a vision of the LORD. He saw the LORD he had been serving as a priest for many years, the LORD whom he encountered in the exercise of his duties, the LORD he was supposed to know intimately. But Isaiah’s vision is anything but familiar. Instead of sitting in the holy of holies, the LORD is sitting on a high and lofty throne far above the Temple with fiery serpents swirling around him. The smallest part of his robe fills the entire Temple; this place that is supposed to be the dwelling place of God can’t even accommodate the tiniest part of his garment. The angels that attend the LORD sing a seraphic song that calls the LORD “Holy” three separate times, as if to say, “You have no idea who you are dealing with.” To top it all off, an earthquake shakes the very foundations of the Temple as the building fills with smoke. It is a terrifying and majestic vision, and Isaiah could have viewed it as an affirmation of his priestly ministry; Isaiah could have surmised that God was being revealed to him as a reward for his dedication. Instead, Isaiah has the opposite reaction. When faced with a vision of the living God, Isaiah loses confidence in himself, in his vocation, and in his people: “Woe is me,” he cries, “I am lost, for I am a man of unclean lips, and I live among a people of unclean lips.” Isaiah is bereft and humiliated because he realizes that the God he supposedly has been representing is far more powerful, far more expansive, far more than he had previously imagined. This realization leads Isaiah to change his vocation completely. No longer can he serve God in the Temple that can’t even contain the hem of God’s robe. Isaiah instead understands that his prophetic mission is to proclaim the ultimate sovereignty of God: the fact that God transcends all worldly concerns, the fact that in the end, God will be God. All at once, Isaiah comes to the profound and startling realization that the only thing interesting about religion is God. And so, at the commencement of his prophetic ministry, Isaiah is not told to go follow his passion and change the world like the graduates of today, he is instead reminded of how very small he is, of how very parochial his experience of the world and his experience of God has been, and then he is told to go change the world. This morning, we observe Trinity Sunday, which is one of the stranger feasts of the church year. Most other observances in our calendar recall events in the life of Jesus or celebrate the lives of the saints. Trinity Sunday, however, is the celebration of the Christian doctrine that the one God is manifest in three distinct persons: Father, Son, and Holy Spirit. Only the doctrine of the Trinity has this unusual distinction. There’s no “Doctrine of the Divine and Human Natures of Jesus Christ Sunday” or “Filioque Clause Sunday.” Given it’s unique place in the calendar, it is easy to fall into the trap of using this Sunday as didactic opportunity to square the Trinitarian circle, to explain how 1+1+1 can equal 1. The greatest theologians of the Church, however, have argued persuasively that the Trinity is not meant to be understood in any human terms. The reason we celebrate the Trinity on an annual basis goes much deeper than mere instruction; in fact, it is the same reason that God appeared to Isaiah. Trinity Sunday is meant to remind us of how very small we are, to help us recognize how our understanding of God is limited by our prejudices, and to give us an opportunity to recognize the fact that God will be God. Ten years ago, the great contemporary philosopher David Foster Wallace gave the commencement address at Kenyon College. Given the context, the most striking thing about his eloquent speech was that he never once told the graduating class to follow their passions. Instead, he reminded them of how very small they are. The speech begins with Wallace giving voice to an assumption that the vast majority of people have: “everything in my own immediate experience supports my deep belief that I am the absolute center of the universe; the realest, most vivid and important person in existence.” This selfishness is our default setting as human beings, and Wallace argues that the task of education, the task of becoming part of society, is to deny this self-centered impulse. He suggests that the only way we can truly deny our selfish nature is by worshipping that which is life-giving. Whether we recognize it or not we all worship something. We are free to worship either that which encourages our self-centeredness or that which empowers us to deny our selfish nature and reach out in humility to others. 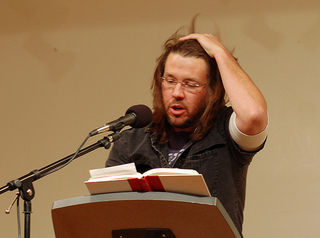 True freedom, Wallace argues, involves making the correct choice and “being able truly to care about other people and to sacrifice for them.” This is the witness of David Foster Wallace, but it is also the witness of Isaiah son of Amoz, it is the witness of Trinity Sunday, and indeed, it is the witness of the gospel. It is only when we are humbled that we can begin to make a difference. It is only when we acknowledge that there is something greater than ourselves that we can truly change the world. Sermon on John 15:9-17 offered to the people of the Church of the Redeemer in Bryn Mawr, PA. Audio for this sermon may be found here. “Abide” is one of those words that tends to show up only in very specific contexts. Even though it just means “stay” or “remain,” we tend not to use it in everyday conversation. It shows up in hymnody all the time: “Abide with me, fast falls the eventide,” “O come with us, abide with us, our Lord Emmanuel.” And as a result of its frequent appearance in hymns, “abide” has become something of an explicitly religious word. Perhaps this is why we don’t use “abide” regularly; it is reserved for loftier purposes. But I wonder if there is a deeper reason that abide is not part of the modern lexicon. “Abide” shares a root with “abode”; if we say that we abide somewhere, we imply that we are making that place our home. “Abide” implies permanence, contentment, a sense that we are not going anywhere for a while. Is there anything that is more at odds with our contemporary preoccupation with progress than a sense of permanence? Our culture insists that we shouldn’t stay in any one place for too long, that should move out of the starter home as soon as it’s financially feasible, that we should always be on the lookout for new job opportunities, that we should always be thinking about what comes next. This impatience for what comes next is motivated by a profound anxiety that there is much more to do, much more to strive for before we can achieve peace and contentment. In this anxious cultural context, the worst thing we can possibly do is abide. This kind of anxiety is nothing new. When Jesus gathers with his friends prior to his crucifixion, the disciples are riddled with apprehension, uncertain about what will happen next. This morning’s gospel reading comes from a section of John in which everything the disciples say betrays their trepidation: “Are you going to wash my feet?”, “Lord, we don’t know where you are going, how can we know the way?”, “Lord, just show us the Father, and we will be satisfied.” It’s no wonder that the disciples are anxious. After all, Jesus has predicted his execution; the disciples know that it is only a matter of time before the authorities come to arrest him. It is in the midst of this swirling anxiety that Jesus offers these startlingly simple words of assurance: “As the Father has loved me, so I love you; abide in my love.” These words are surprising because they do very little to alleviate the anxiety of the disciples; indeed, Jesus doesn’t even address their concern about what will happen next. Rather than engaging their concerns about the future, Jesus challenges the disciples to embrace the present. This would have been countercultural for the disciples even if they weren’t worried about Jesus’ impending Passion. Much of the first century Jewish experience was about waiting for what comes next. There are two pivotal stories from the Hebrew Bible that gave shape to the way the Jewish people understood the world. One was the Exodus, the story of how God liberated God’s people from slavery and led them to the Promised Land. 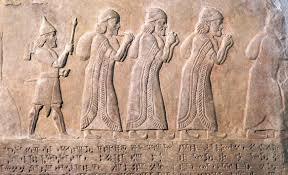 The other was the exile, the fact that God’s people were removed from the place God promised and forced to live in a strange land. The centrality of the exile meant that the Jewish worldview was one of yearning and expectation. This continued into the first century because even though the Jewish people lived in the land promised to them by God, they did not posses it; it was a territory of the Roman Empire. The centrality of both Exodus and exile meant much of the first-century Jewish experience was about looking to the future: the future when God would expel the foreign occupiers from the promised land, the future when the Messiah would rule with justice and equity, the future when God’s people would be free to live in peace. So when Jesus tells his disciples to abide in his love, he challenges this worldview. And by telling his disciples to abide, Jesus taps into another deep tradition from the Hebrew Bible, one affirmed by the psalmist when he calls us to make “the Lord our refuge and the Most High our habitation.” Jesus taps into God’s promise that we will abide with God regardless of what happens to us. The story told in the Bible is the story of a God who abides with his people even when they have been cut off from everything they know. The Exodus, therefore, is not a story about a circuitous journey to the Promised Land; it is a story about a God who remains with his people as they fail and falter their way through the desert. The exile is not a story of mere deportation, it is the story of how God’s faithfulness endured even though God’s people had been removed from the promised land. Moreover, the incarnation is the embodiment of the reality that God abides among us, and the resurrection the affirmation that not even death can disrupt God’s abiding presence. Jesus challenges the disciples to recognize that God is with them even in the midst of their anxiety and uncertainty. Jesus challenges the disciples to abide in the knowledge that God’s love endures even the most difficult circumstances of their lives. Jesus challenges the disciples and challenges all of us to get out of the endless cycle of striving, to buck the culture of “what’s next,” and recognize that we have a home in God. For many of us, the very idea of abiding is frightening. We think that if we stay in one place, the world will pass us by. 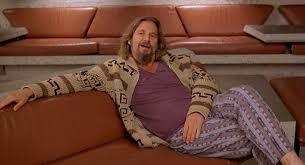 We assume that in order to abide, we have to adopt the the Dude’s perspective, detached and disengaged from the world. But Jesus does not tell his disciples to abide in blissful ignorance; he tells them to abide in his love. Abiding is not just about remaining in one place oblivious to the realities of life; it is about being in a mutual, dynamic relationship with the one who created and redeemed us. We enter this relationship through worship, through the practice of sabbath. The practice of sabbath, the discipline of staying put, allows us to understand that God sustains creation even when we take a break. The discipline of sabbath allows us to understand that the time we have is a gift from God. At its best, our worship is about providing a space in which we can put away anxiety and abide in God’s love.